Brand: Invicta Model number: 25985 Gender: Men's Series: Marvel Display Type: Analog Case Shape: Round Case Material: Stainless Steel Case Diameter: 53 millimeters Case Thickness: 0 millimeters Dial Color: Green Dial Hands: Silver Dial Markers: Silver index Band Material: Polyurethane and Stainless Steel Band Length: 9 inches Band Width: 30 millimeters Band Color: Black and Stainless Steel Clasp: Buckle Crystal: Mineral Bezel: Stainless Steel Special features: Hulk Movement: Quartz Water resistant depth: 10 ATM/100 meters/330 feet With its most inspired creations yet, Invicta demonstrates its technical and design prowess, offering timepieces of style for extreme value. This Men's watch from the Marvel collection features a Black and Stainless Steel Polyurethane and Stainless Steel Strap and Green Hulk dial. 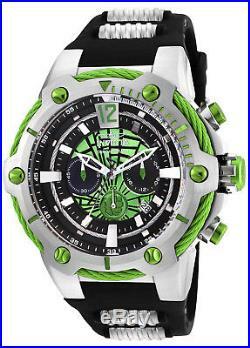 The item "Invicta Men's 25985 Marvel Hulk Black Steel Polyurethane Steel Watch" is in sale since Monday, July 2, 2018. This item is in the category "Jewelry & Watches\Watches, Parts & Accessories\Wristwatches". The seller is "watchingo" and is located in Brooklyn, New York. This item can be shipped to United States, Canada, United Kingdom, Denmark, Romania, Slovakia, Bulgaria, Czech republic, Finland, Hungary, Latvia, Lithuania, Malta, Estonia, Australia, Greece, Portugal, Cyprus, Slovenia, Japan, Sweden, South Korea, Indonesia, Taiwan, South africa, Thailand, Belgium, France, Hong Kong, Ireland, Netherlands, Poland, Spain, Italy, Germany, Austria, Bahamas, Israel, Mexico, New Zealand, Philippines, Singapore, Norway, Saudi arabia, Ukraine, United arab emirates, Qatar, Kuwait, Bahrain, Croatia, Malaysia, Brazil, Chile, Colombia, Costa rica, Panama, Trinidad and tobago, Guatemala, El salvador, Honduras, Jamaica, Antigua and barbuda, Aruba, Belize, Dominica, Grenada, Saint kitts and nevis, Saint lucia, Montserrat, Turks and caicos islands, Barbados, Bangladesh, Bermuda, Brunei darussalam, Bolivia, Ecuador, Egypt, French guiana, Guernsey, Gibraltar, Guadeloupe, Iceland, Jersey, Jordan, Cambodia, Cayman islands, Liechtenstein, Sri lanka, Luxembourg, Monaco, Macao, Martinique, Maldives, Nicaragua, Oman, Peru, Pakistan, Paraguay, Reunion.